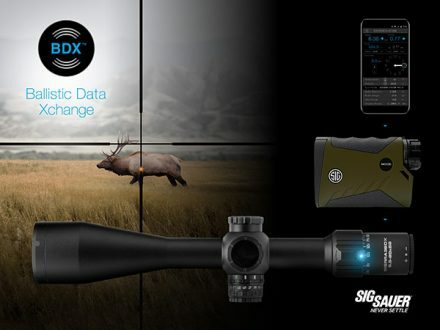 Newington, N.H. (May 4, 2018) – The SIG SAUER Electro-Optics division today unveiled their all new Ballistic Data Xchange (BDX) rangefinders and riflescopes with integrated Applied Ballistics® and wireless Bluetooth® technology. This groundbreaking BDX technology enables interoperability and key ballistic holdover information to be exchanged wirelessly between SIG SAUER BDX Electro-Optics products. The foundation of the BDX system was designed for simplicity and ease of use. SIG SAUER BDX requires no new learning, and uses the same tools hunters and shooters have been using for years. How does BDX work? The BDX rangefinder and riflescope system is simple, fast, and intuitive. Simply download the “SIG BDX” app available for Android or iOS smartphones, pair the KILO BDX rangefinder and SIERRA3BDX riflescope, set up a basic ballistic profile, and then you’re ready to shoot or hunt. Once you are in the field, range your target as you normally would, and the KILO BDX rangefinder will utilize onboard Applied Ballistics Ultralight™ to instantly send your dope to the scope via Bluetooth. Using your basic ballistic profile the ballistic solution is calculated for your target and will instantly illuminate on the BDX-R1 Digital Ballistic Reticle with windage and elevation holds in the SIERRA3BDX riflescope. A blue LED on the riflescope power selector indicates that the BDX system is paired, and when the reticle has received new ballistic holdover and windage data from the rangefinder. Rounding out these superior features is SIG SAUER’s kinetic energy transfer indicator: KinETHIC™. KinETHIC provides assistance in assuring an ethical hunt by indicating when energy on target drops below a threshold that can be set by the hunter using the BDX App. Available at dealers July, 2018. All SIG SAUER Electro-Optics are covered by the SIG SAUER INFINITE GUARANTEE™, and electronic components under our LIMITED 5-YEAR warranty. Please see sigsauer.com for full details. This entry was posted on Friday, May 4th, 2018 at 06:38	and is filed under Optics, Press Release. You can follow any responses to this entry through the RSS 2.0 feed. Both comments and pings are currently closed.